Event Date : 30-31 October 2018. 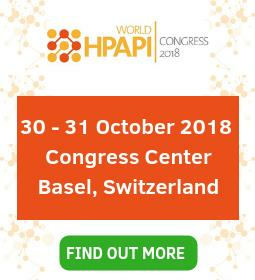 The HPAPI World Congress has been developed over 4 years as the only two tracked HPAPI Congress. The event has a strong focus on the management of HPAPI, Design of Facilities, Innovation of New HPAPI’s, SHE, Working with CMOs and case studies. We have a diverse group of companies and consultants along with a mix of different formats to provide the best possible learning experience for our participants. We will be presenting many first releases on the event including understanding a new class of ADC linker and discussing new factories in development. There are a range of new questions about the management of HPAPIs including the banding of agents. As part of the Festival of Biologics, the HPAPI World Congress will be co-located with World Biosimilar Congress, World Immunotherapy Congress and European Antibody Congress. Attendees will have access to plenty of content across the 3 days and more networking opportunities than ever before with over 800+ leading industry professionals. Register today and benefit from the 15% partner discount. Simply use the voucher code FNYP when you register online here. Why not bring your colleagues along too? Book a group of 3+ people and get an additional 20% off!